Went out to Harrison cameras at the weekend as we where passing by. What a fantastic shop! They have a wide range of stuff there and you can get it all out and play with it. No amount of reviews can make up for holding the thing in your hand. The staff know their stuff, I went in with the usual usless request but he coped well and narrowed me down to what I actually wanted. 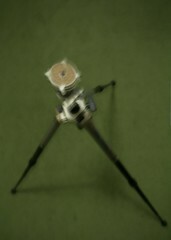 The Velbon Ultra Maxi SF tripod. Fantastic, it a little bit more that the bottom of the line ones but it does pack down quite a bit smaller so I am more likely to use it. It has a ball and socket head which is pretty easy to use, loosen off the head then point the camera where you want to shoot, then tighten the head again and Bob’s your uncle. I was worried that it would make it a little difficult to adjust then keep it still while I did the wing nut up but it is rock solid so no problems there. It also has the added benifit that it can hold the camera so low that I can almost make the lense touch the ground. There is no quick release but screwing it on takes a moment with the jumbo nut and base combo, nice use of cork!